Oat is consumed as cereal throughout the world. It is one of the preferred food for people who suffer from diabetic condition. One can consume oats with milk as porridge, as an ingredient in nutrition bar, oat meal bread etc. If you want to have something bit spicy then, here we are presenting oats khichadi (Pongal) recipe. It is as delicious as rice pongal and can be breakfast or lunch item for diabetic patients as well as for those who love to have oats. Prepare jeera and pepper coarse powder. Cut green chilli to small pieces. Place a vessel on medium heat and add ghee. To heated ghee add cashew and let it turn slightly golden brown*. Now add cumin and pepper coarse powder, curry leaves, green chilli, grated ginger, asafetida and turmeric powder. Once the aroma releases from the seasoning ingredients add little water, salt and turmeric. Bring water to boil. Add oats and cook it for couple of minutes. Add cooked moong daal and mix well to get Pongal/khichadi consistency. Continue mixing and heating for couple of minutes more and turn off heat. 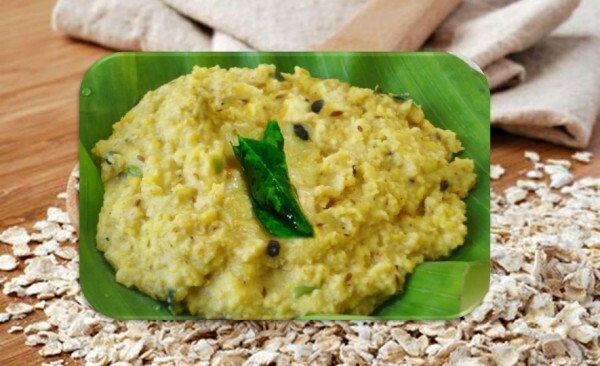 Serve hot Pongal/khichadi with coconut chutney.